Apple is a consumer technology company that has introduced any number of popular devices and that just makes some people so mad. Was it with kindness? It was probably kindness. Or piano wire. Mobile World Congress 2018 was strange. First of all, there were monkeys everywhere. And they were all wearing pants. But not monkey pants, they were like businessmen from the waist down. Second, the walls were all moving in psychedelic waves and then a whale with an elephant’s head swam through and ohhh, wait, that was an acid trip, not Mobile World Congress 2018. All the innovation was in the network side, handsets have become boring. …the handset folks seemed to think a better camera, smaller bezels and painful emojis were in some way special. And that’s Apple’s fault because Apple hasn’t reinvented the smartphone category. Again. Rockman waxes nostalgic for the days before 2006 when the conference was called 3GSM and was held in Cannes and manufacturers were innovatin’ like crazy before Apple ruined everything. To be clear, and the Macalope is not making this up because these are the phones he mentions by name, the phones he’s pining for are this taco phone, the Nokia 8810 which — are you sitting down? — had a slider over the keyboard, and the Motorola V.box which can best be described as “eMate, the phone.” Basically, Rockman longs for the return of crazy, dead-end concept phones. Which… uhhh, OK! That is a thing you can long for! The horny one doesn’t know why you would do that but it is a thing that one can do. Personally, the Macalope doesn’t need a smartphone with a cup holder. But that’s just him. But somehow there is the Orwellian myth that Apple invented the Smartphone. Who promulgated that myth? Not Apple. Apple’s always been clear that it reinvented the smartphone, right from the start. (You could also say that Apple invented the modern smartphone.) But Rockman’s got a bee in his bonnet about this point because the BBC got it wrong in a recent radio documentary he listened to and implied that Apple had “invented” the smartphone. SIMON was the first ever smartphone, with predictive text and a touch screen 13 years before Steve Jobs sprinkled marketing fairy dust over an overpriced 2G phone with severe signalling problems, broken Bluetooth and the inability to send a picture message. Yes, the original iPhone was just marketing. It didn’t feature a revolutionary interface that allowed it to act more like a full-fledged computer in your pocket than anything ever before. And you all remember the Simon, right? Well, maybe you can be excused since it was only on the market for six months and sold 50,000 units. That may be mostly true from a technology perspective, but Apple’s whole raison freakin’ d’être is packaging technologies and making them work in ways that people are actually likely to use, rather than just slapping them into a phone and going to lunch. …Apple showed that marketing was more important than technology. Rockman keeps saying this without backing it up. But design is not marketing. People didn’t send the Simon to the junk drawer of technology because it wasn’t marketed the right way. They didn’t buy it because it was six times the size of an iPhone and had a starting price of $899 on contract in 1994. Also, it was 1994. People were just getting used to personal computers. Hardly anyone was on the web, let alone concerned they might be addicted to it. Now all phones are just black rectangles. Whose fault is that? Apple’s or the companies' that slavishly copy Apple? Maybe this is boring for hardware fans, but the idea is kind of to make the device disappear. What people want is what’s on the screen, not what’s behind it. Rockman looks forward to a time we can all get out from the iron heel of Apple and back to crazyphones. The hope comes in the death of the smartphone. … All this follows on the heels of Alexa and her friends. And people like the devices. As your cooker, television and bath all become smart there is less need for the single smartphone. The Amazon Echo Show, Bath Edition. Sure. That’s not disturbing. 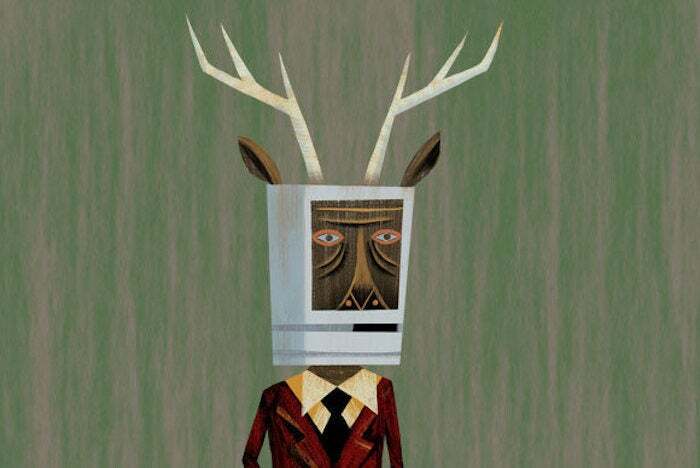 The Macalope doesn’t understand why the success of the iPhone drives some people nuts even to this day. But, no, Apple didn’t invent the smartphone, it reinvented it. And the reason it’s successful is that people liked it.